Content warning: Eternity Girl contains content relating to suicide. Depression and anxiety are two themes I would never associate with a visually stunning and emotionally compelling comic book, but writer Magdalene Visaggio and artist Sonny Liew are able to create just that in Eternity Girl. Coming from DC’s Young Animal imprint, the six-issue miniseries Eternity Girl focuses on a topic that most DC and Marvel books tend to shy away from. It is rare to find a story that features a main character who wants to die. In Eternity Girl, the main character deals with suicidal thoughts throughout the whole story—it is special and haunting, especially coming from a superhero story. The opening pages of Eternity Girl throw the reader back into different ages of comics, as we are introduced to Caroline Sharp by drawing her origin story in the art style of the Silver Age (1960s), Bronze Age (1970s) and modern age (1985 to now). This is done to introduce not just Caroline but her life as the superhero Chrysalis, the covert government agency Alpha-13, and the villainous Madame Atom. 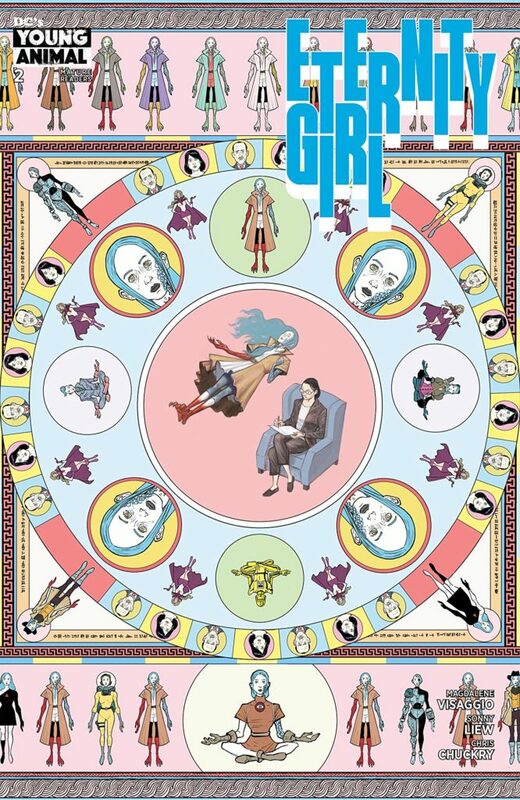 As Caroline’s character was introduced in Milk Wars, the crossover between DC Comics and their Young Animal Imprint, it was refreshing to receive such a unique way of giving Eternity Girl a backstory. The prologue shows what type of powers Caroline has, how she became disfigured, and how she is immortal, which makes the beginning of the story so shocking. The story begins with Caroline jumping off a bridge and talking to her therapist about how she has attempted everything possible to take her life. Not an uplifting way to start a story, but it certainly is engaging to the reader. Caroline was put on administrative leave from Alpha-13 because of an incident that involved her losing her temper at work, destroying her office and a coworker’s arm. She is having issues controlling her powers; after years of using them, they have become unstable and cause her to struggle with simple tasks, such as keeping a civilian appearance. Her life has become a living hell, and she starts to get visits from the long-dead Madame Atom, who tells her that there is a way to end her suffering: the end of existence. Throughout the book, Caroline must fight her desire to commit this act, as she continues to fall into and through a dark path of her life. Despite the book dealing with heavy subjects like depression and suicidal thoughts, it has moments of humor and creates unforgettable characters. Even though I had no prior knowledge of the character (as I regretfully skipped all of Young Animal’s previous works), Visaggio’s writing style has a sense of familiarity with the characters, allowing an easy introduction to Caroline. This is aided by the cartoon styles that Sonny Liew infuses with the story, as it creates a shockingly beautiful world around such a sad and haunting story. 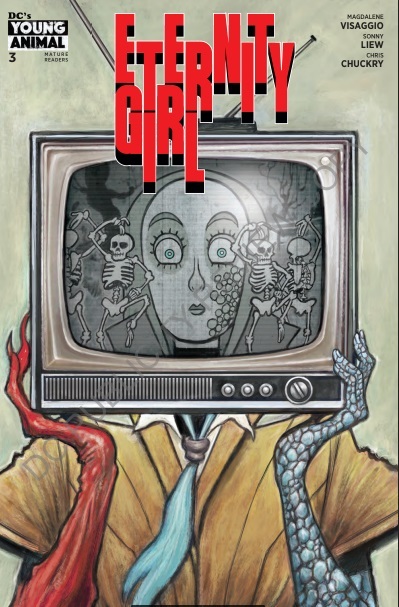 Eternity Girl does require a reader’s full attention, as it can become confusing when the story dives into Caroline’s mind. At certain times in the comic, the story is told by using homages to such stories as Mad Max, Peanuts, and Metropolis. Sonny Liew’s illustrations of Peanuts-like panels are a perfect tribute to Charles M. Schulz, with the comic-strip layout and art style at times looking as if Schulz drew it himself. Liew’s artwork is absolutely stunning throughout. With the constant changing of style, it was a perfect representation of what Caroline is feeling, as well as a showcase for Liew’s talent. Visaggio’s writing at times is overshadowed by Liew’s art, but she is able to create a story that feels personal and different from the average comic. Despite coming from DC comics and even featuring cameos of superheroes and villains, Eternity Girl‘s art style and tone make it feel like an indie comic. The only negative is that the last issue feels rushed, and the story would have benefited from being an issue longer. I’m not sure if there are plans to continue Caroline’s story or to feature the character in other stories, but the ending does allow the story to continue, and if that happens, it will be interesting to see where it goes. Eternity Girl made me laugh and almost cry. I would recommend this book for the artwork and the story that fights against the stigma of mental health.